Juweela is a manufacturer that is fairly new here to Armorama. 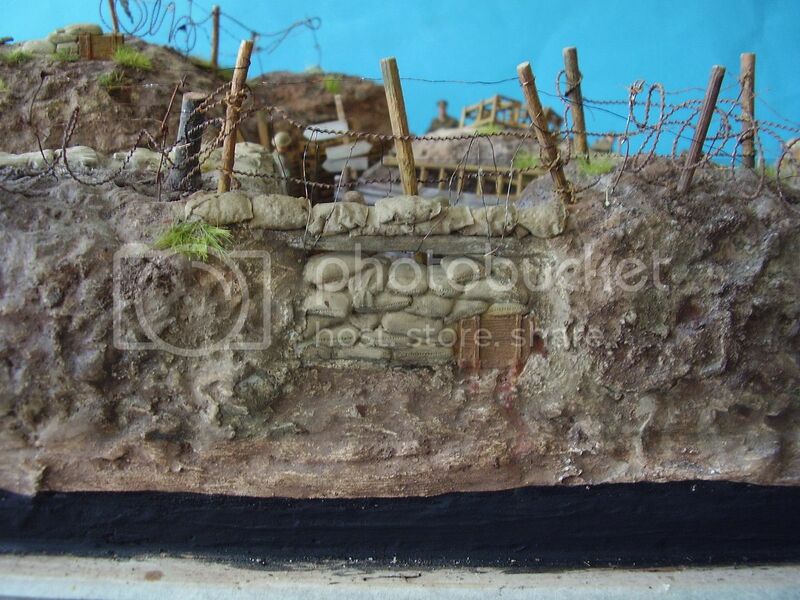 They have quite an extensive line of diorama accessories that tend to run toward building supplies; bricks, pavers, corrugated sheet metal and such. They also make a set of flexible sandbags that are the subject of this review. The sandbags come packaged in an attractive plastic box and are well protected. Opening the box you find that the sandbags are in a ziplock bag that is set into a vacuform plastic sleeve that fits into the box, so three layers of protection should keep your sandbags in good working order. You can get a set of 25, 50, or even 100 sandbags; for the review they sent us a box of 25 but actual count showed 27 sandbags in the box; thanks Juweela! The back of the box shows how to form the bags using a glue and water solution. Pretty easy stuff so I thought I would give it a whirl with an old Sherman that hangs around for just this sort of thing. I mixed up a 75/25 solution of white glue and water and set to work. T dipped each bag into the solution allowing it to soak up what it wanted, gently pressed out the excess and placed it on the Sherman's glacis plate. I used a cocktail stick to push down and help shape the bags to give them a more natural sit and after 6 bags left it all to dry overnight. The next day showed that the bags had dried to a nice rock hard finish. I tried Vallejo and Tamiya paints on the finished bags and both paints worked well and painted easily. A quick dust with pigments to give them that good dusty look and I was done. I am impressed with how easy and quick these little bags were to use. The price is a bargain when you consider how many you get in a box, one set will give you enough to really add a convincing number of sandbags to any model. Highs: Very easy to use, nice price as well, and best of all very convincing. Lows: None, these are inexpensive and easy to use. They look like pillows from a queen size bed. Agree completely. They also look underfilled. Perhaps I am being over simplistic but how hard is it to tie one end off yourself before wetting and placing them.